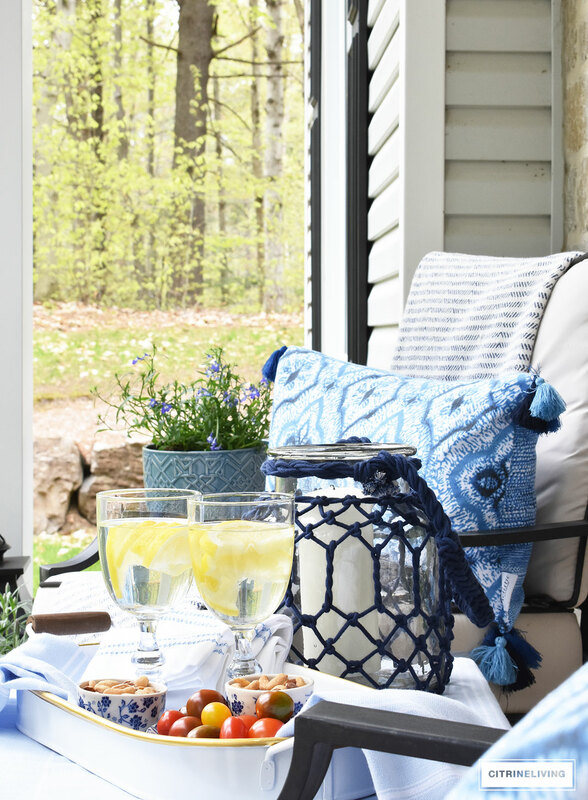 I’m so happy you’ve joined me today – I’m sharing our Spring front porch decorated with blue and white accents, and I’ve joined up with a fun and fabulous group of bloggers to bring you our outdoor decorated spaces – you can see everyone on the tour at the bottom of my post. If you’re a first time visitor and you’re coming over from my very talented friend, Shelia of Maison de Cinq, welcome to our home! I hope you enjoy the tour today, and I’d love it if you’d stick around a while! As always, if you’re a regular reader, you know how much I love to have you here. The weather is finally becoming somewhat decent in our Northern climate, and it feels so good to be able to start pulling together some outdoor decor. 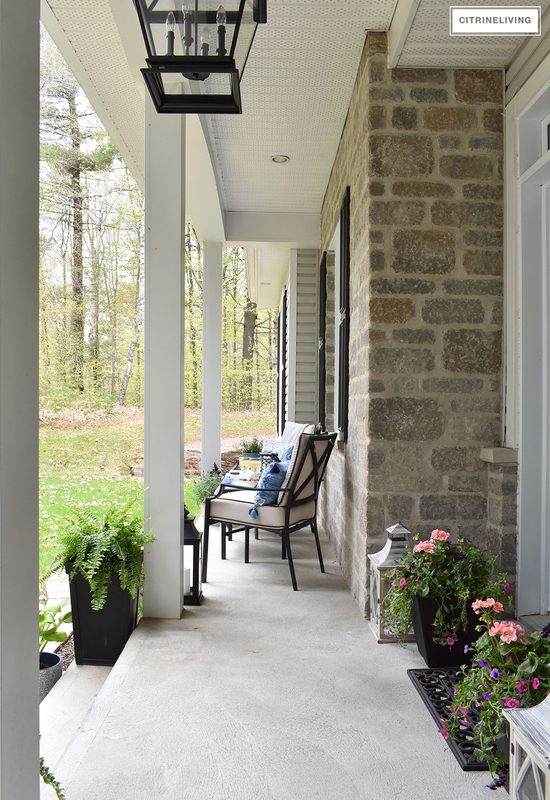 We haven’t had too much time to enjoy this space just yet, but this little spot on our front porch is one of our favorite places to have morning coffee or a refreshing drink in the evenings. This is my spot, right here, and my beautiful view. We are at the end of the road, on a cul-de-sac, with no passing traffic except passers-by walking their dogs, and riding their horses. We’re very lucky to live in a wooded equestrian neighborhood – it’s quite the treat to have such peaceful surroundings. I bought these little purple flowers (I have no idea what they’re called because I am no gardener!) 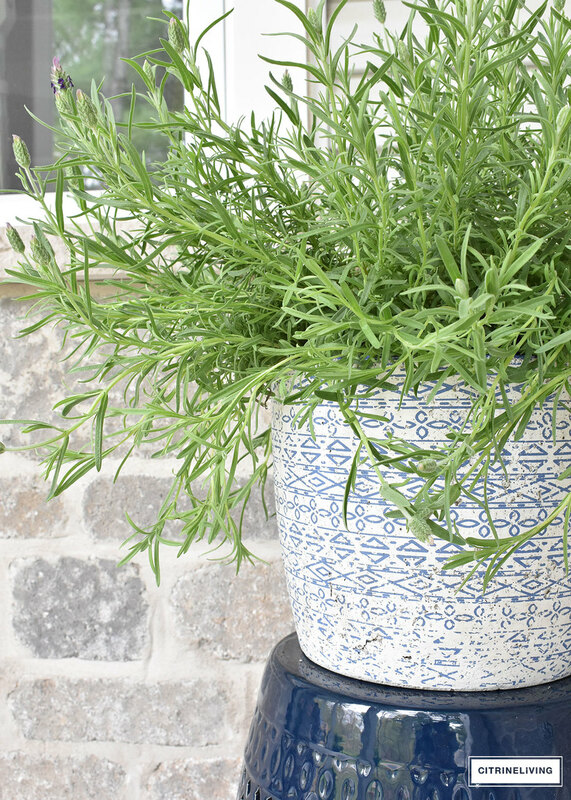 and put them in this pretty blue planter, atop one of my navy garden stools. I am a garden stool fanatic by the way – I have quite a collection and I use them all over our home. 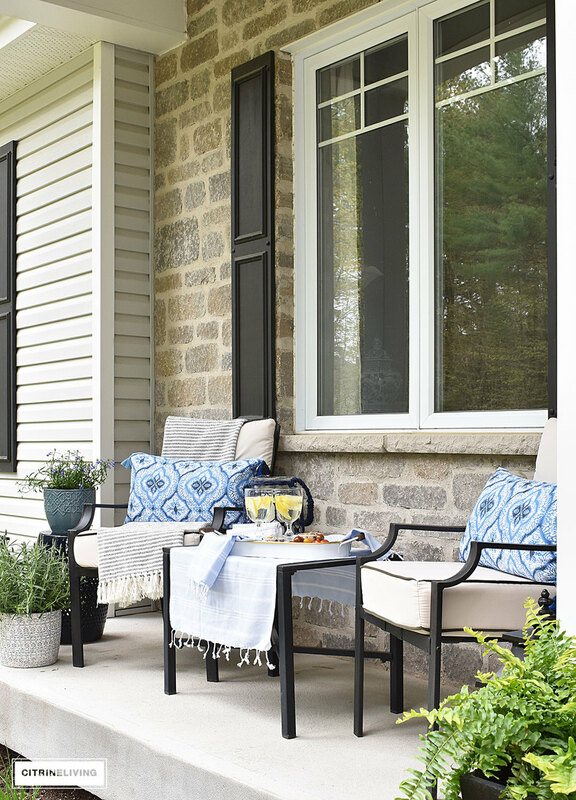 I have a really fun roundup blog post, (to read it, click here), if you’re looking for different ways to use them around your home. 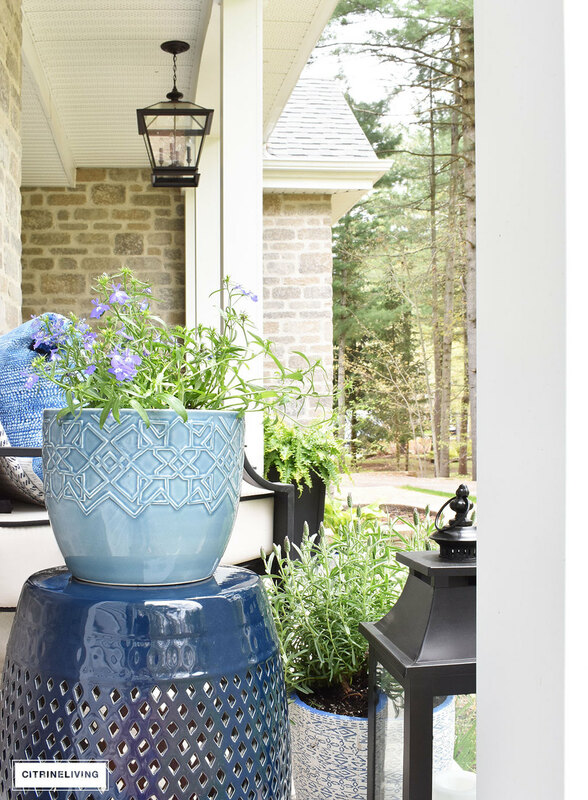 I have a few of these gorgeous blue and white planters that I recently found at Canadian Tire , to use on the back patio and I love the tribal vibe they add here – stay on the lookout for my backyard patio makeover coming soon! 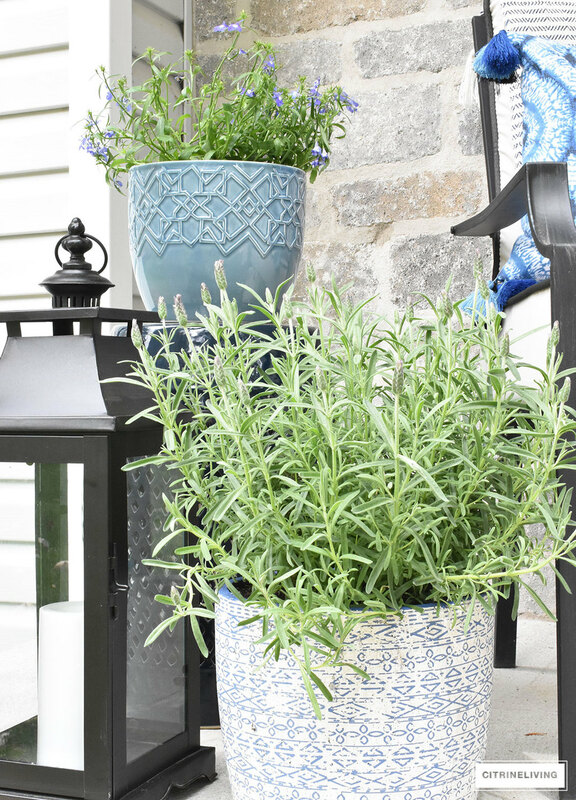 I planted some lavender in this pot, as well as another one at the other end of the porch. I really hope I can keep these plants alive! You’ll have to check back in the Summer to see how they do. 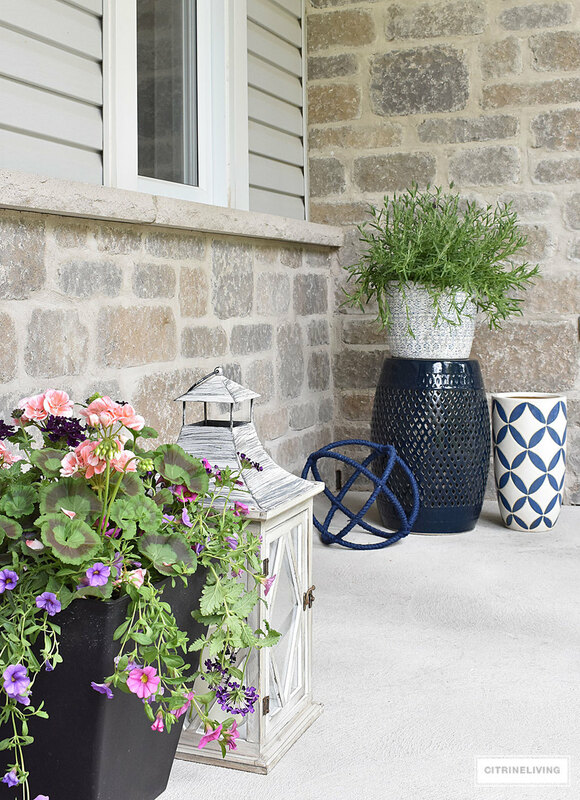 I always love to add my touches of blue and white throughout our home, and believe it or not, this is the first year I’ve added it to the front porch. 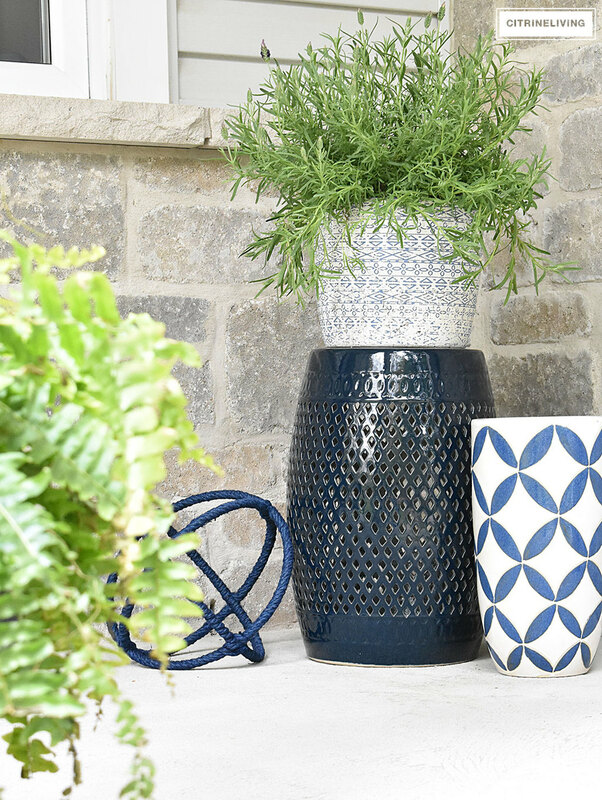 I use them on the back patio, with lots of layers of pattern and texture. 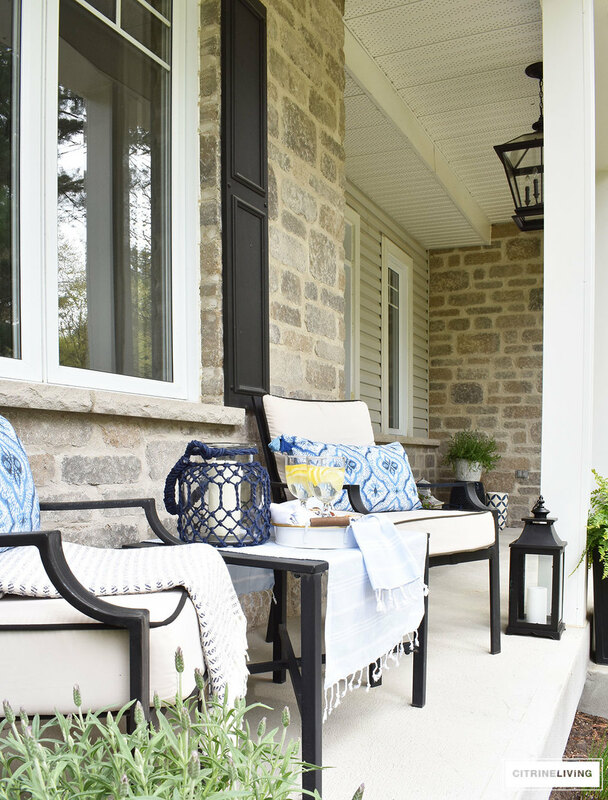 You can visit my Summer Home Tour (here), from last year, to see what I’ve used out there. I really love how much my favorite colors freshen the look in the front of our home too. Aren’t these little tasseled pillows so chic? I love them. I used some of my newest finds to set up a little snack station and drinks to create this scene. 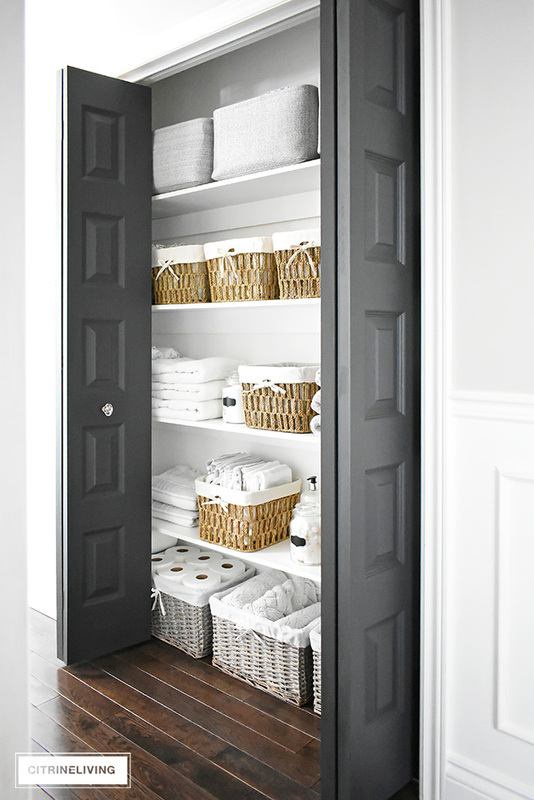 Turkish towels (my new favorite thing! ), a cute little metal tray and some blue and white dishes of course, are some of my go-to items for quick entertaining – all sources are listed at the bottom of my post – just scroll down to have a look. Last week I shared a rustic blue and white tablescape in the kitchen with some of these favorite things – read all about it here. 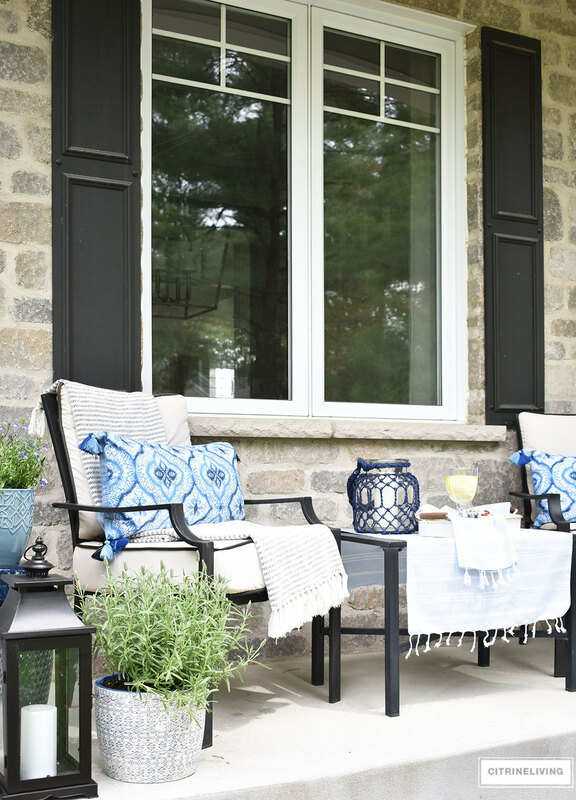 I found the cutest navy blue macrame lantern, I love the coastal charm it adds to this spot and it helps build on this little bit of a ‘boho-chic’ vibe that’s going on. Layer, layer, layer! 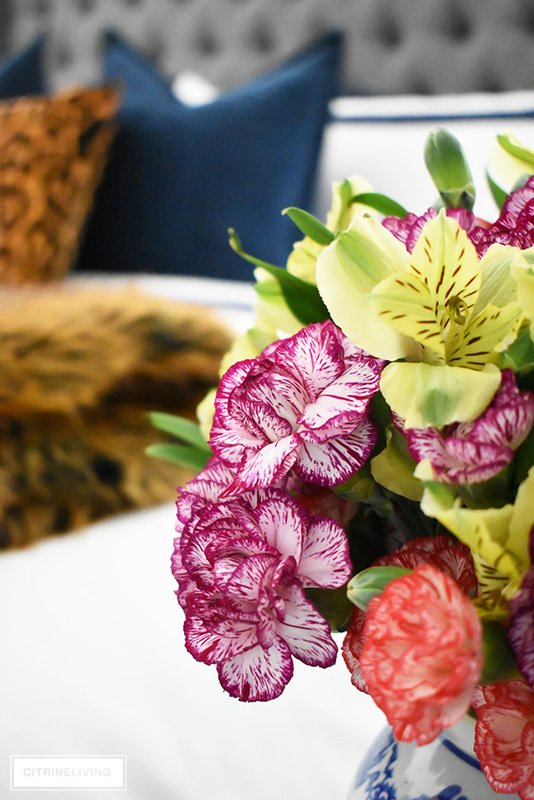 I love to use layers to add interest and dimension to any space. The porch is no exception! 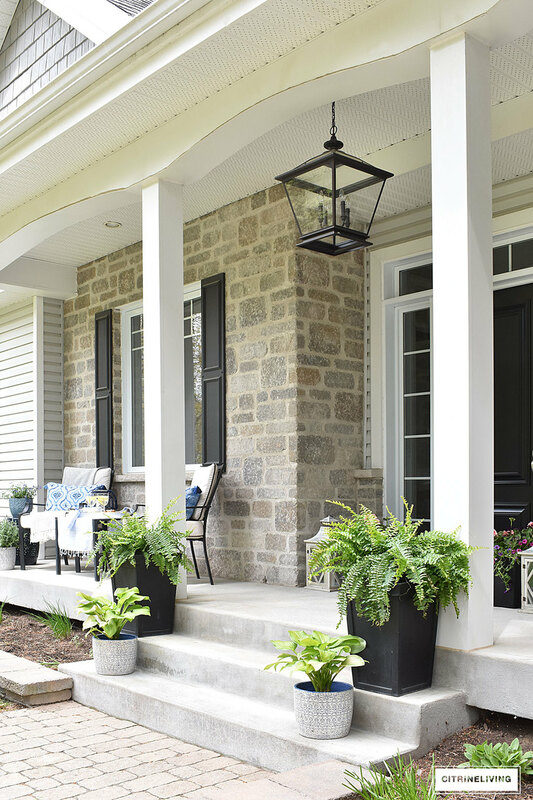 On the steps, I added ferns to my planters this year, and I have to say I absolutely love them! I hope they survive. I am all about using anything that requires as little maintenance as possible, so I’m banking on these! The hostas are also new, and although they’re perennials, I love the way they look in pots. 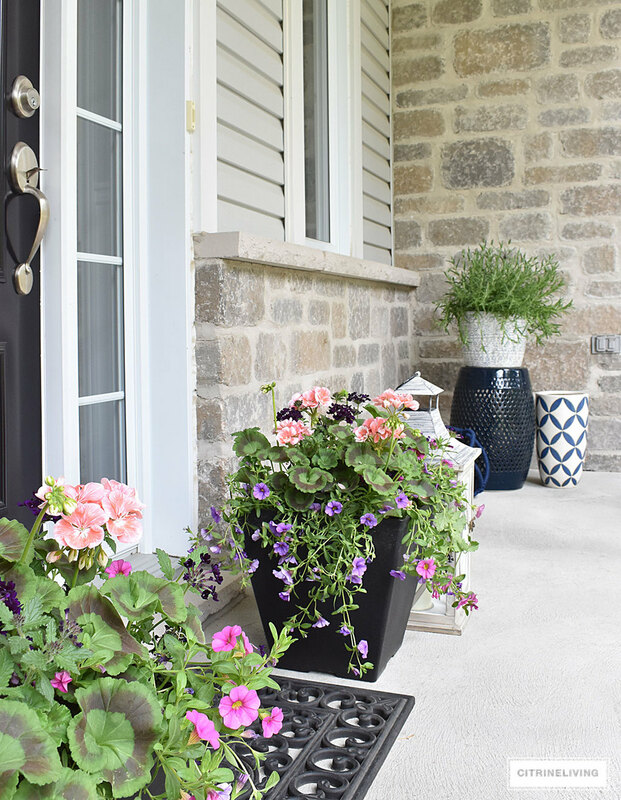 The arrangements in front of the door are so pretty and I was elated when I found them already arranged and in these cute little containers – from the store to the front porch – that’s my kind of gardening! 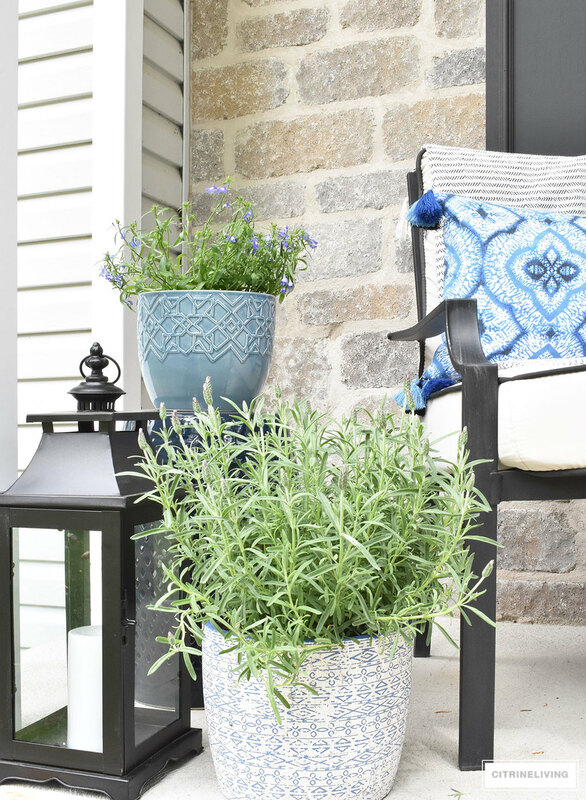 Over in this corner, I added another potted lavender plant atop my second navy stool, and played up the blues and boho-chic look with a geometric planter (I don’t know what to put in here – any ideas?! Tell me below!) and a rope-wrapped orb with nautical flair. I also love to mix different pieces and bring together items you may not think of trying. 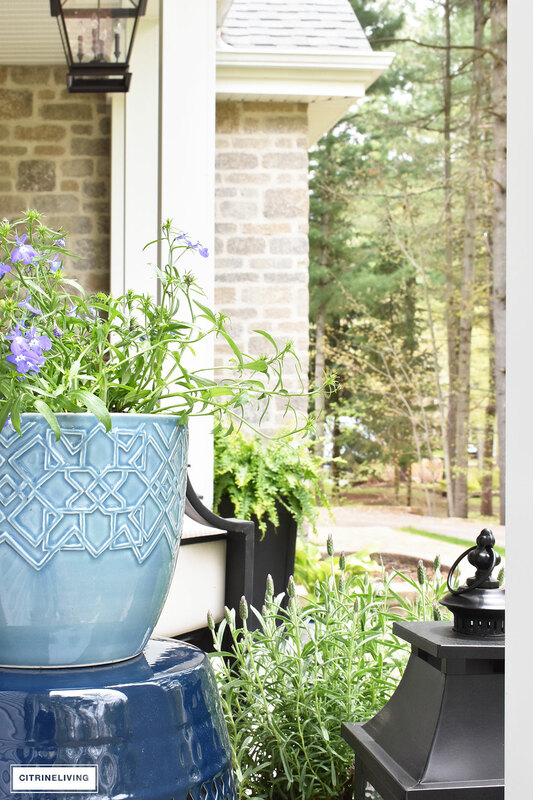 I wasn’t sure if the look of my new potted arrangements would look cohesive with my more relaxed accents in blue and white. As it turns out, I love it and think it looks great. You have to try new things and experiment before you decide – there’s always a fun surprise to discover, I guarantee it! I use the same approach inside our home as well. I chose to keep the front door flanked with the pink arrangements, and use the blues everywhere else, to visually envelope them. 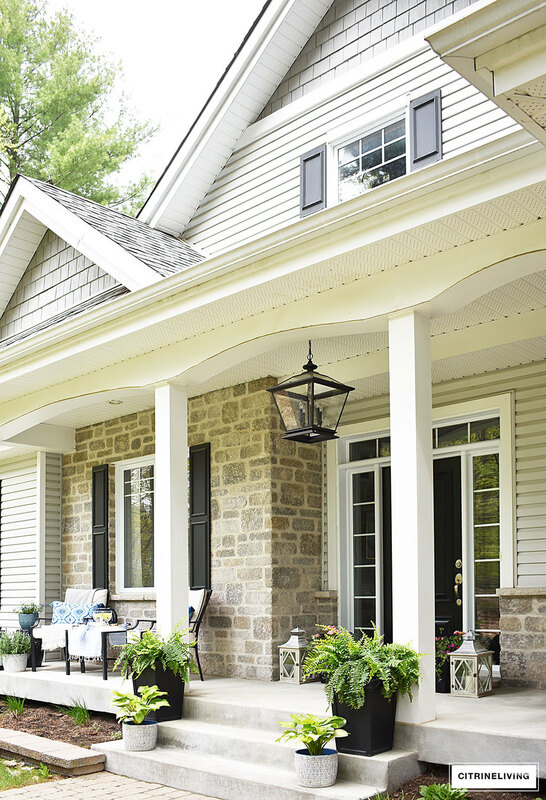 I love to create symmetry wherever I can, and the front steps are perfect place to use it. 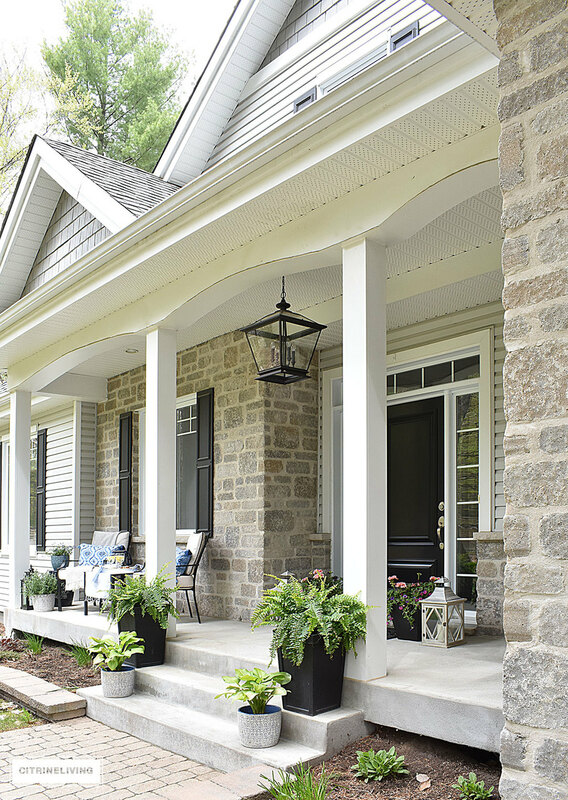 I hope you enjoyed getting a peek at our front porch today! Hopefully soon our plants will be much bigger and blooming…I’m eagerly awaiting my peonies! Thank you for stopping by today, please don’t forget to visit everyone on our tour, listed below. 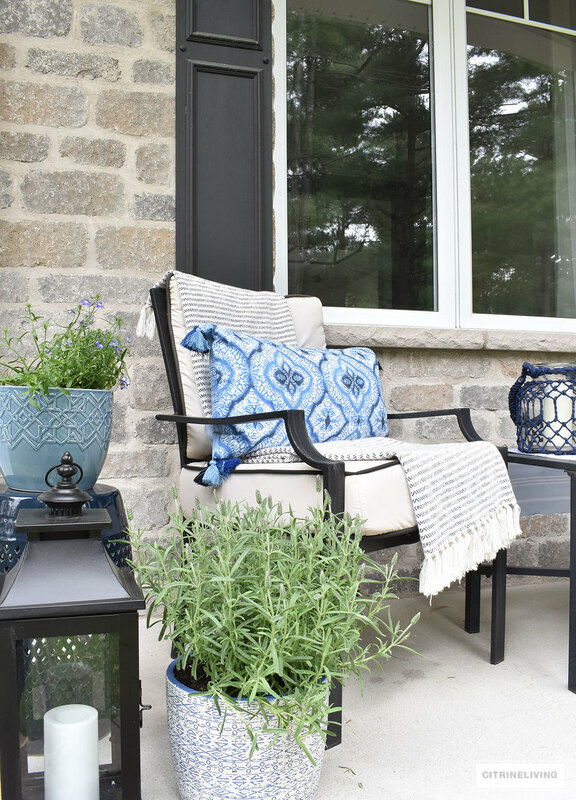 Next in line are Lacey and Kim, of Styled with Lace – a fabulous mother-daughter duo, sharing Lacey’s new deck makeover – you’re going to love it! *Affiliate links are used as sources for some of my favorite items. These are either the same as the items featured in this post, or are similar options for your shopping convenience. BEHIND THE SCENES OF MY BETTER HOMES & GARDENS PHOTOSHOOT! 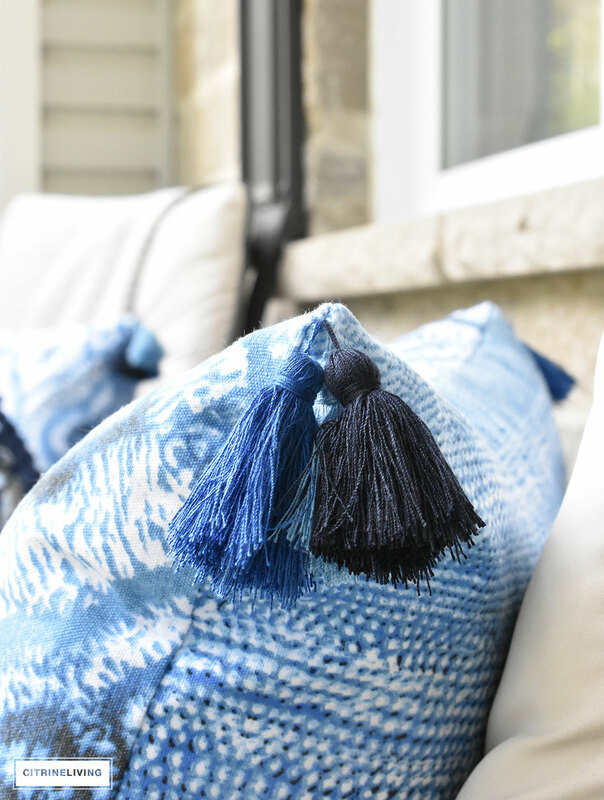 Love your fresh blue touches on your porch, Tam! So pretty and so inviting! SO beautiful Tamara! I can see that you love garden stools as much as I do! Just perfect and I especially love the tasseled pillow! 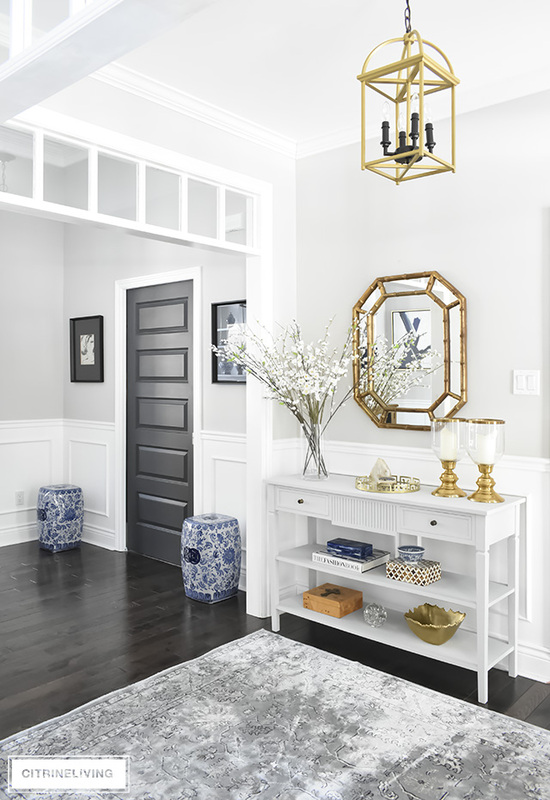 What a welcoming space and I love the blue accents… great job! 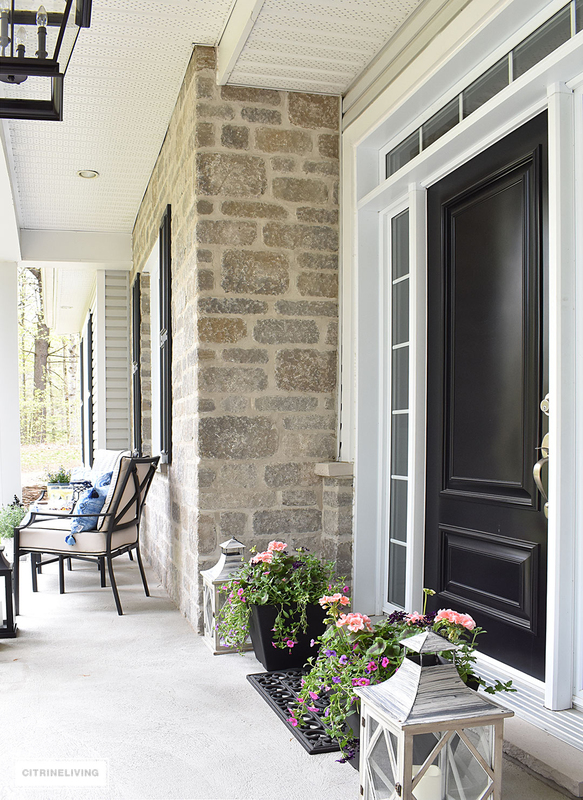 Tamara, for someone who hasn’t had the weather yet, your porch is sure looking gorgeous and READY! 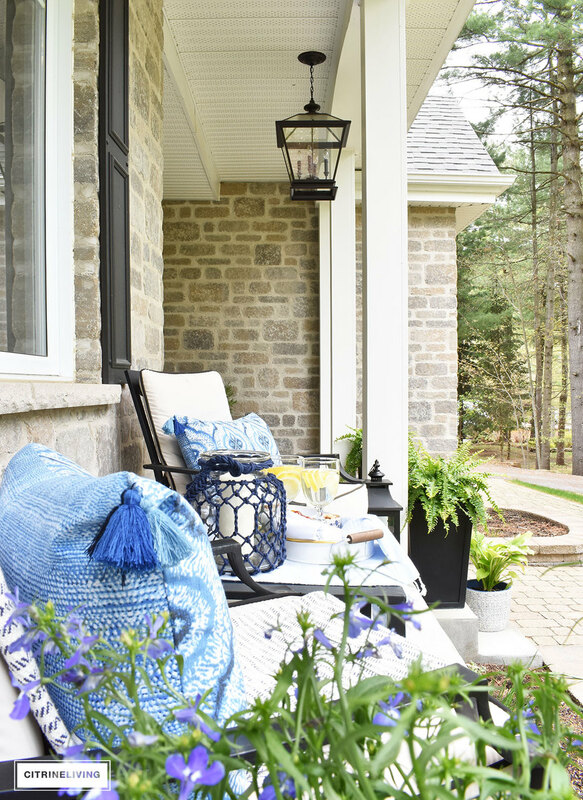 I love that you’ve included your signature blue and white through to the porch, it looks so beautiful! 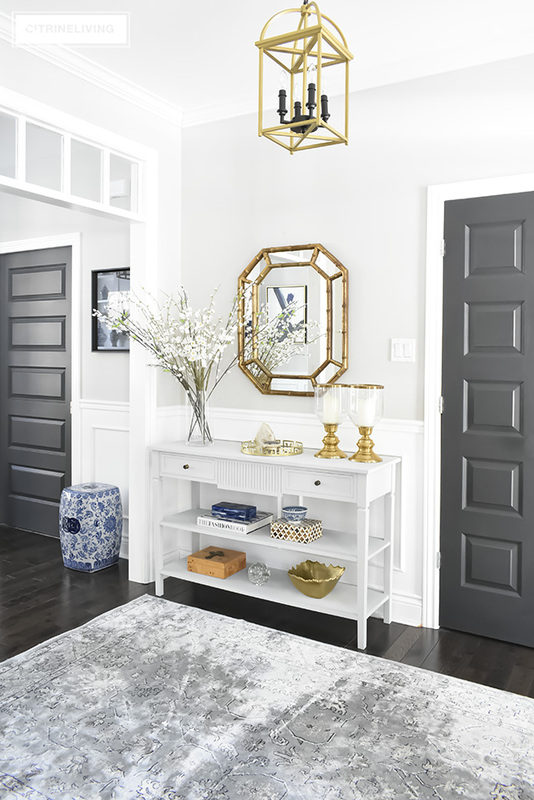 I couldn’t agree more about your cute accessories and personal touches – all your layering adds so much dimension to the space. 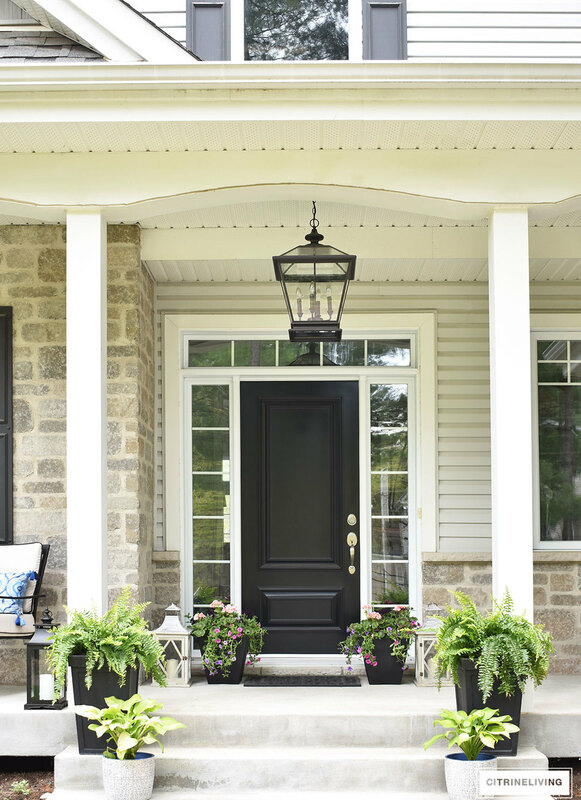 And I’m a sucker for symmetry so your front door is right up my alley! Loved “hopping” with you, as always! Sheila, thank you my friend!! I got very lucky with the one day I had nice weather! The universe was on my side haha! This week has been amazing weather so far too, and it’s been so nice to sit out on our porch! SO happy to hop with you too! Muah!! Tamara! 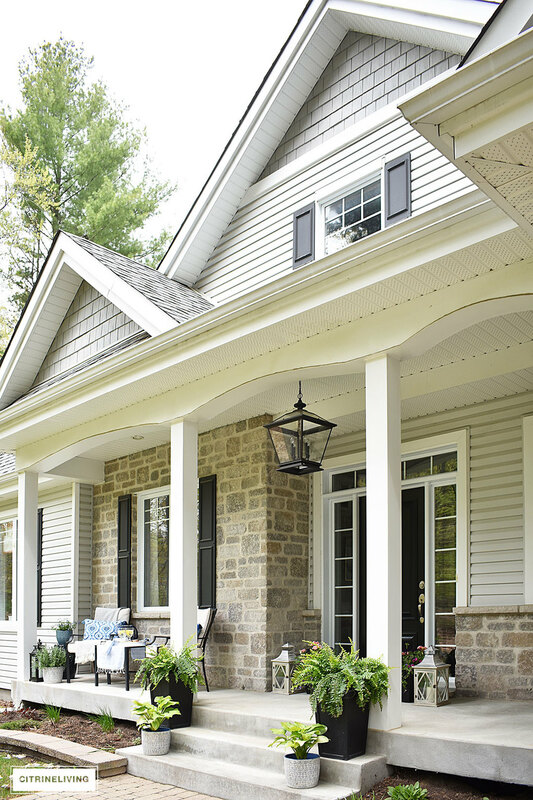 What a stunning front porch and in such a beautiful serene setting! 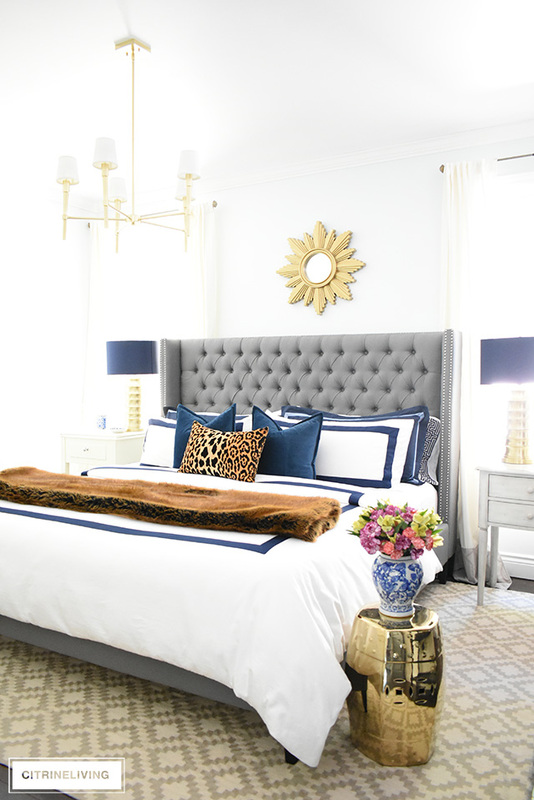 Love the classic blue and white and every detail is so perfectly styled! As always your decor is so inspiring!! 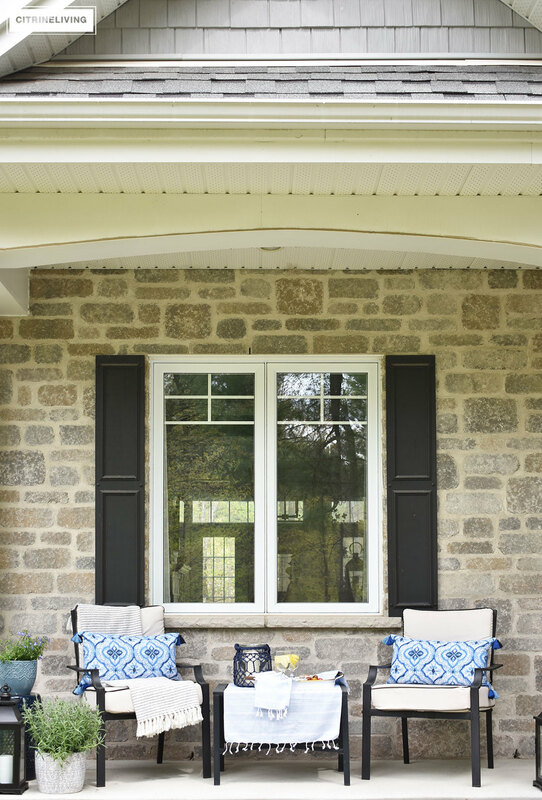 It looks so inviting out in the front, and the scenic passersby makes for interesting relaxation time! 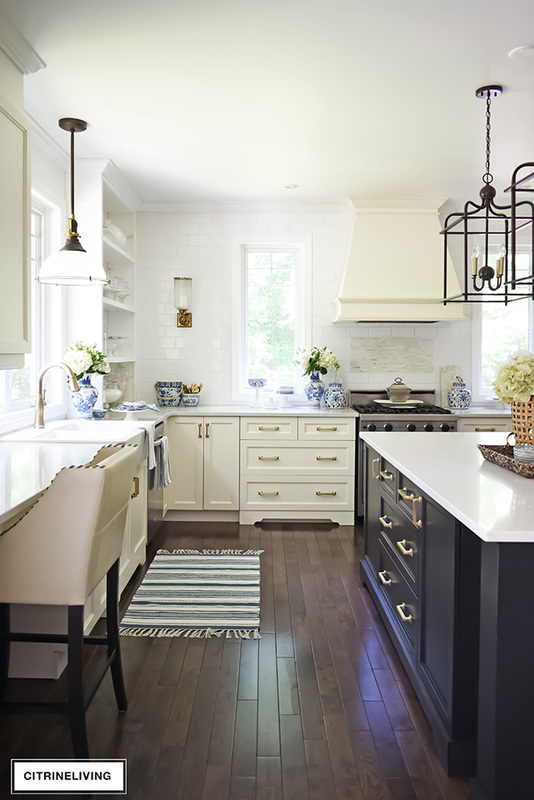 Blue and white is classic anywhere, and outside very fresh, and clean. You know me, I’m a big fan of symmetry as well, always get two!!! Or you’ll be back there looking for its mate!!! Planter you could do birch sticks, umbrellas, branches that already have the lights on them for some ambiance in the evening! Thanks for sharing! Checking out your post from last summer now! Janae, thank you so much! All such fabulous ideas, I love them so much, especially the lights for evening ambience! I’m so happy you stopped by to visit, thanks for taking the time to say hello!